I chose this picture for no other reason than it's kind of funny. The attack of the Trayvon Robinson with the security guard holding him at bay with a folding chair. I could've gotten something more relevant to the game, but I didn't. The other reason I chose this one is because Trayvon Robinson and diving appear to go hand in hand so far this season. He may have a limp noodle for an arm, but he certainly tries. Which is obvious, since he's with the big league club and you don't get there by being a lazy couch potato who doesn't try. Robinson also hit a home run in this game. It wasn't a cheap one either, by which I mean it wasn't hit right down the line and barely cleared the fence. He got extended on a ball on the outer half and drilled it over the center field fence. 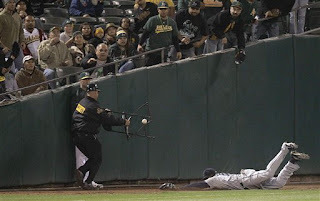 It was very nearly a home run ball that wasn't, since Coco Crisp is a big meanie and tried to rob Trayvon of his home run. He very nearly did, with the ball practically scraping the top of the glove as it went over the fence. We're not here to talk about Crisp's meanness though. We're here to talk about the Mariners losing to the Athletics 8-2, so let's talk more about Trayvon. Robinson isn't the next Giancarlo Stanton or something like that. We may be lucky if he develops into a decent fourth outfielder, but the long ball is still a magical thing. Hey Boone, it's not just chicks that dig the long ball. Here's a picture to see where the ball was! by the way, in case you're wondering where these graphs come from, take a look at Brooks Baseball. It has more information than you can shake a stick at. That number three is the pitch he hit over the center field fence. You hear all the time about a player needing to get extended to be able to use all of his power. On this pitch, he got himself extended and hit it a ton. Not only was this a home run, it was Robinson's third home run of the season. One more than he had last year in 5 fewer plate appearances. That's not saying a whole lot since we're talking miniscule sample sizes, but we'll look anyway. To see the difference between last year and this year, there's a few stats we can find on Fangraphs. They're under the plate discipline tab if you care to look. Keep in mind, these really are small sample sizes, but they still tell a story. Last year, Robinson had a SwStr% of 17.5%. This is the number of pitches he swung at and missed. This year, it's at 13.5%. That's still a lot, but a vast improvement for the individual. Two other numbers to keep in mind are O-Contact% and Z-Contact%. OC% is the percentage of pitches a batter makes contact with outside the strike zone when swinging the bat. ZC% is the same, only with pitches inside the zone. For Robinson, last year his numbers were OC% 38.2% and ZC% 77%. The average for 2011 in the majors was 68.1% and 87.9%, respectively. Plate discipline was a club he had yet to take out of his bag. This year, those numbers have improved a bit. The OC% and ZC% for Trayvon this year are 60% and 81.1%. A huge improvement in his OC%, but still below the average. He has also improved his ZC% a bit, bringing it closer to respectable. If you want something a little easier to chew on, his OBP has gone from .250 last year to .291 this year. He walked in 5.2% of his plate appearances last year and 9% this year in roughly the same number of plate appearances. He's still below the average, but he's getting closer to being a player that might be worth something, possibly even by next year. I took a lot of time on Robinson because, well, there wasn't really a whole lot to talk about, as far as the game is concerned. If you dislike the Angels, it was fine because they were unable to gain ground on the A's. If you like the Angels, you probably weren't watching anyway. At least if you dislike the Angels there's a higher probability you like either the A's or Mariners. Blake Beavan was himself, in that he gave up a lot of contact and the Athletics did damage when their bat met the ball. Charlie Furbush had a game he probably would rather forget quickly, but he has been and will continue to be a nice player to have in the bullpen, regardless of today's results. Michael Saunders hit another home run, instilling himself as a pleasant surprise that nobody saw coming. If you say you saw this coming, you should call the fire department because you're lying and your pants are on fire. Another pleasant surprise, in a one game sample, was Hector Noesi. One game isn't going to change anybody's mind about him, but it was nice to see him come out of the bullpen and actually be effective. In 1 2/3 innings, he didn't give up any hits or walks and had three strikeouts. Even with the 0 hits given up, you still probably assumed he gave up a home run at some point, but you'd be wrong. It's okay to be wrong sometimes, especially when it comes to baseball players, since they're very much unpredictable no matter how hard we try. I'll admit, this was a hard game to get in to from the very first pitch of the game and I ended up falling asleep, so as far as insights are concerned, I'm afraid I used it all up on Trayvon Robinson. One thing I can tell you for sure though, is that the Mariners still haven't solved the whole hitting with runners in scoring position thing yet. They're not the worst though. The only stats I could find on a team level was here and it's only RISP with 2 outs. Seattle is batting .206 with 152 RBI in that situation. They're ranked 27th in average, but 30th in RBI. They really need to sign a big bat this offseason you guys. It's kind of bad. A Saturday matinee, where the Oakland Athletics and Seattle Mariners will get together at the O.co Coliseum and play a baseball game at 1:05pm Pacific. It'll feature Dan Straily for the Athletics and Jason Vargas for the Mariners throwing the baseball towards home plate in defiance of the player with the big stick. I'll tell you something though, Vargas is second with 35 home runs given up this season and the A's are a home run hitting club. I don't know about you, but my expectations are set pretty low.